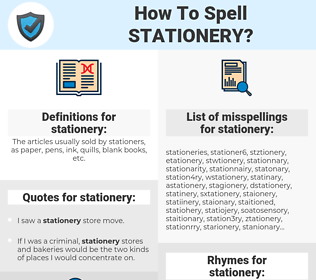 What are the misspellings for stationery? What are the common mistypes for stationery? What are the quotes for stationery? What are the rhymes for stationery? What are the translations for stationery? 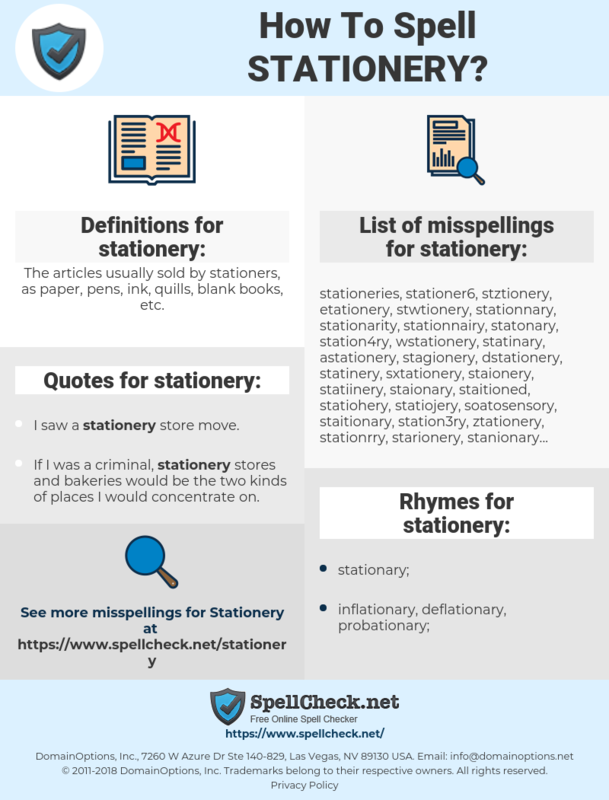 What are the common typos for stationery? The articles usually sold by stationers, as paper, pens, ink, quills, blank books, etc. This graph shows how "stationery" have occurred between 1800 and 2008 in a corpus of English books. kantoorbenodigdheden, schrijfwaren, kantoorartikelen, kantoorbehoeften, schrijfgerei, schrijfbenodigdheden. articles de papeterie, papier à lettre. Schreibwaren, Briefpapier, Büromaterial, Bürobedarf, Büroartikel, Schreibmaterial, Schreibwarenhandlung, Papeterie, Papierwaren, Papierware, Geschäftsdrucksachen, Firmenbriefpapier, Papeteriematerial, Schreibzeug, Schreibmaterialien, Schreibbedarf, Büropapier. канцелярские товары, канцтовары, почтовая бумага. material de papelería, material de oficina, artículos de papelería, material de escritorio, papel de escribir, artículos de escritorio.